The Asian Legal Business Hong Kong Law Awards recognise the excellence and outstanding achievements of Hong Kong’s leading law firms and in-house legal teams. We are very pleased to announce that Haldanes was once again awarded the Criminal Law Firm of the Year at an awards ceremony held at the Conrad Hotel. The award was received by our partners Andrew Power and our founder Warwick Haldane. 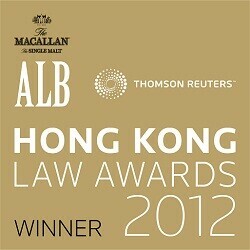 Being the Criminal Law Firm of the Year for 12 consecutive years reflects market recognition of Haldanes’ outstanding performance in the legal field in Hong Kong. All of the awards were selected by a panel of independent judges based on nominations from leading practitioners and in-house counsel.